Starting with the primary features, it has X Frame which is designed just right to setting up the tent easily in the ground. Even though it does not have mesh room and windows, still proper ventilation can be done through tent walls of mesh. In order to keep your things safe, it has a large bag where you can place and safe things of use. Wenzel Dome Tent (5 Person) Features. The features introduced in the above paragraph are needed to be reviewed in detail so let’s get on with that. Fly Hoop Pole with X Frame. Your camping fun would be destroyed in the initialization if it is an ordinary tent which takes much force to setup in the ground. In case of Wenzel Dome Tent, you are provided with X Frame which comes with a fly hoop pole which makes it very easy to be setup on the ground. You will be doing it with a little force and even if you are trying alone, you can set this up conveniently on the ground. People go for premium tents because of the presence of mesh windows and tents which make it possible to do the proper ventilation. Even though our Wenzel Dome Tent (5 Person) does not features these windows and vents, it has mesh walls through which proper ventilation is possible. In case the weather gets dirty out there and get to face a rainy weather, you can attach the rain fly at the very moment to save yourself from it. This removable rain fly can be removed and attached at any time with ease. A rain fly is basically a double layer of tent which saves you from getting wet with rain water. Weight and Dimensions do matters because a heavy product is harder to carry for camping and dimensions are important since they are concerned with space. 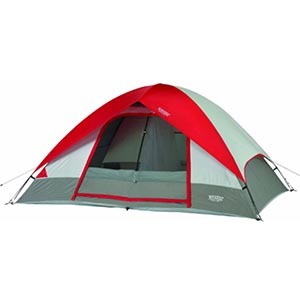 The dimensions of Wenzel Dome Tent are 10×8 ft. which are wider enough for five people and it weighs only 8 pounds. Economical Tent for Five People. A large bad to capacitate it with important stuff. Mesh walls which work as vents. May not withstand extreme weather conditions. Not Polyester so can be called an average quality product. We would only recommend you this product if you are unable to raise your budget for some high quality tents which can be bought. With the average mentioned budget, this product would do just fine.